Median gross rent in 2016: $1,262. Ancestries: Irish (19.4%), American (14.6%), German (12.4%), English (9.9%), Scotch-Irish (3.7%), Italian (3.3%). Land area: 3.03 square miles. Population density: 1,027 people per square mile (low). 109 residents are foreign born (1.6% Europe, 1.0% Africa, 0.5% Asia). Nearest city with pop. 50,000+: Fayetteville, NC (28.8 miles , pop. 121,015). Nearest city with pop. 200,000+: Raleigh, NC (56.5 miles , pop. 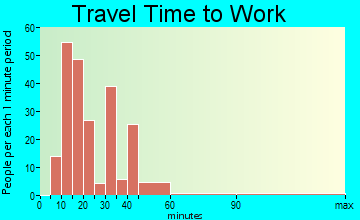 276,093). Nearest city with pop. 1,000,000+: Philadelphia, PA (401.4 miles , pop. 1,517,550). 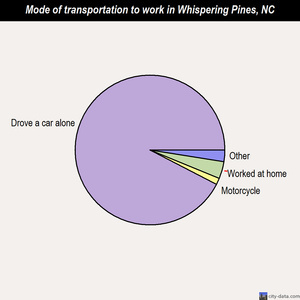 Nearest cities: Vass, NC (2.3 miles ), Southern Pines, NC (2.3 miles ), Carthage, NC (2.4 miles ), Pinehurst, NC (2.6 miles ), Taylortown, NC (2.7 miles ), Cameron, NC (2.9 miles) , Aberdeen, NC (3.0 miles ), Pinebluff, NC (3.4 miles ). Full-time law enforcement employees in 2016, including police officers: 9 (8 officers). Population change in the 1990s: +641 (+44.2%). 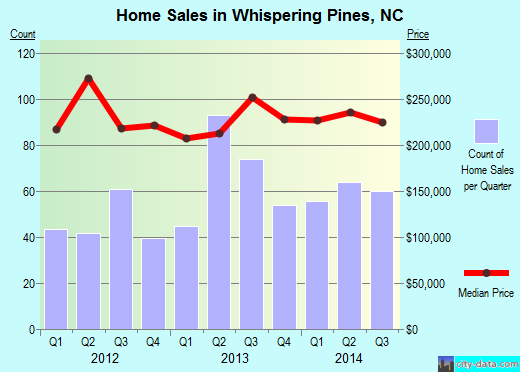 Whispering Pines-area historical tornado activity is slightly above North Carolina state average. 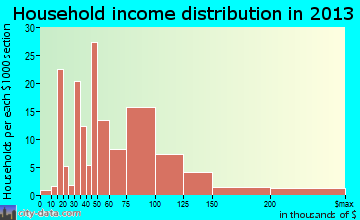 It is 5% greater than the overall U.S. average. On 3/28/1984, a category F4 (max. 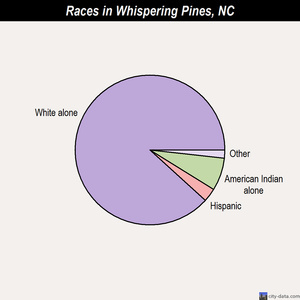 wind speeds 207-260 mph) tornado 35.8 miles away from the Whispering Pines village center killed 4 people and injured 395 people and caused between $5,000,000 and $50,000,000 in damages. On 3/28/1984, a category F4 tornado 40.0 miles away from the village center killed 7 people and injured 100 people and caused between $5,000,000 and $50,000,000 in damages. 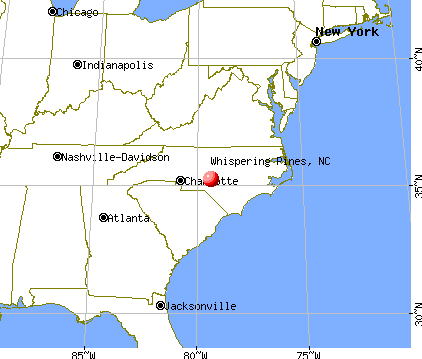 Whispering Pines-area historical earthquake activity is slightly below North Carolina state average. It is 87% smaller than the overall U.S. average. The number of natural disasters in Moore County (12) is near the US average (13). Causes of natural disasters: Hurricanes: 6, Droughts: 2, Ice Storms: 2, Blizzard: 1, Freeze: 1, Winter Storm: 1 (Note: Some incidents may be assigned to more than one category). 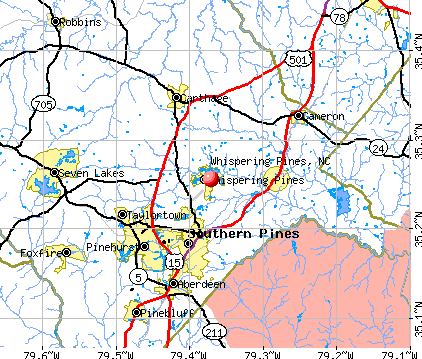 6 miles: SOUTHERN PINES (N. WEST BROAD ST.) . Services: enclosed waiting area, public restrooms, public payphones, free short-term parking, free long-term parking, call for taxi service. 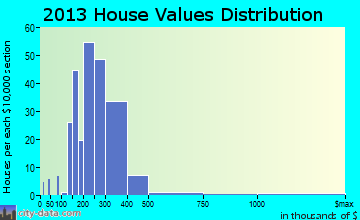 Number of rooms per house above state average. #86 on the list of "Top 101 cities with the most residents born in South Africa (population 500+)"
#88 on the list of "Top 101 cities with the most residents born in Southern Africa (population 500+)"
#53 on the list of "Top 101 counties with the largest number of people moving in compared to moving out (pop. 50,000+)"
#88 on the list of "Top 101 counties with the highest number of deaths per 1000 residents 2007-2013 (pop. 50,000+)"
#101 on the list of "Top 101 counties with the highest percentage of residents relocating from foreign countries between 2010 and 2011 (pop. 50,000+)"
There are 25 pilots and 10 other airmen in this city. Total of 17 patent applications in 2008-2019.